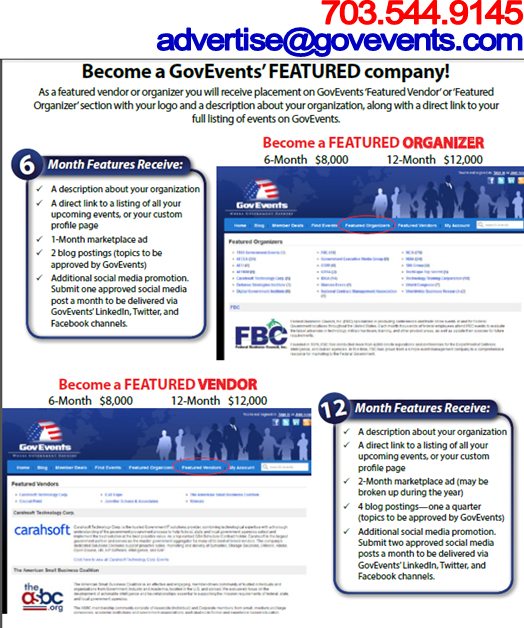 Want to be a Featured Vendor? Find Out How! Federal News Network 1500 AM and FederalNewsRadio.com comprise the key source of breaking news, information and analysis for the individuals responsible for carrying out and supporting the missions of federal agencies. Federal News Network addresses federal agency managers, policy makers and contractors. Federal News Network’s coverage is non-partisan, non-political and is designed to help executives more clearly understand and make better decisions about issues affecting their agencies and their companies. Federal News Network broadcasts live on 1500 AM throughout the Greater Metropolitan Washington area. FederalNewsRadio.com distributes government-to-government and business-to-government news and information worldwide. Federal News Radio features the talents of some of the best federal minds in the industry. The Federal Drivewith Tom Temin airs weekdays from 6-10 a.m. and 3-7 p.m. Our reporters, Jason Miller, Jared Serbu, Nicole Ogrysko, Scott Maucione and Senior Correspondent Mike Causey, make Federal News Radio an up-to-the-minute source of news and information. Carahsoft Technology Corp. is the trusted Government IT solutions provider, combining technological expertise with a thorough understanding of the government procurement process to help federal, state and local government agencies select and implement the best solution at the best possible value. As a top-ranked GSA Schedule Contract holder, Carahsoft is the largest government partner and serves as the master government aggregator for many of its best-of-breed vendors. The company's dedicated Solutions Divisions support proactive sales, marketing and delivery of Symantec, Storage Solutions, VMware, Adobe, Open Source, HR, HP Software, Intelligence, and SAP. GovDirections LLC is the leading publisher of local, state and federal government contract information and resources. We serve businesses that are seeking to do business with the government, those who are successfully working with the government and those in between. Federal, state, and local governments will award an estimated $7 trillion in contracts to the private sector in 2014 and during that same time period, GovDirections will deliver over 1.4 million bids to registered companies streamed to their online account, then delivered via a personalized email on a daily basis. Sign up for your 30 day free trial or to subscribe with a special GovEvents member discount rate.